Rakesh Katragadda of Ann Arbor launched his company with $30,000 credit card debt. Ann Arbor based AMF-Nano Corp, founded by Rakesh will build sensors for General Motors Components Holdings LLC and Iowa Family Farms. An active Michigan Indian community member is a graduate of Wayne State University and lives in Ann Arbor with his wife and two sons. 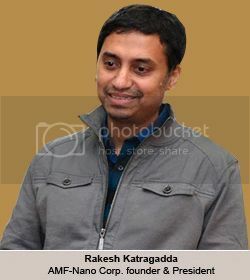 Rakesh's company has three patents and is equipped to makes wireless environmental sensors about the size of a penny that monitor water and air quality, temperature, humidity, soil quality and other conditions. From farming to space technology "sensors" are expected to control every aspect of our lives in the coming years. We hope Rakesh's pioneering work will enrich lives and boost Michigan as a wireless sensor technology hub. Recently, AMF-Nano Corp received funding from angel investors including a couple of leading Michigan Indian businessmen.